Comparing and Buying a PoleDanzer Dance Pole for your club, dance studio or home. There are a few things to consider when comparing and purchasing a new dance pole. Not all dance poles are built the same. Many inexpensive dance poles can be found on the internet. Many are made in China with inferior materials and construction. Some of of our customers have purchased an imported dance pole only to have it break after minimal use. Whether you are purchasing for your club, dance studio or home, your professional PoleDanzer dance pole will perform flawlessly and last a lifetime. We guarantee it. 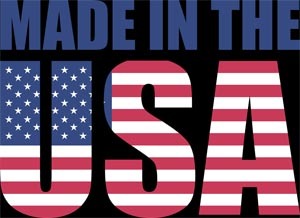 A PoleDanzer dance pole is hand-crafted in California using the highest quality materials purchased in the U.S.A. The Master Pole Maker at PoleDanzer has been making dance poles for over a decade. His quality workmanship guarantees that your dance pole will work safely when installed correctly. PoleDanzer Dance Poles and Stripper Poles have no plastic parts or springs. 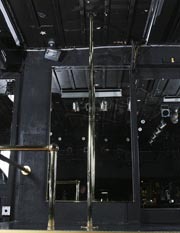 Our dance poles are available in polished brass or polished stainless steel. Dance poles are not only for the professionals and clubs any longer. Pole fitness is the latest way to get in shape and tone your body! These dance poles are for the ultimate cardiovascular work out. You will be exercising multiple muscles in your body and keeping toned by pole dancing on your PartyPole dance pole and you can entertain at the same time. PoleDanzer dance poles are easy to install and come with easy to follow instructions. Our instructions page contains pole installation videos and step by step instructions . If you still need help you can always call us at 760-419-5914 . The PoleDanzer permanent spinning dance pole is our most popular pole for clubs and dance studios. Custom Built to your specifications, this pole is available in polished brass or polished stainless steel. High quality stainless steel ball bearings insure smooth spinning and long wear. 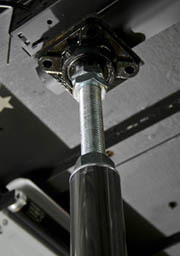 Adding a pole lockout lets you stop the spinning. The pole is available in lengths up to 20 feet. You can choose 1 or 2 piece construction ( you won't see the seam). Two piece construction saves money on shipping as all poles 15 feet and under ship for free in the continental United States. This pole has all of the features of the spinning pole without the spinning. Many fitness centers and dance studios find this model perfect for their dance workouts and fitness routines. The PoleDanzer 45mm permanent spinning dance pole is a slimmer 1 3/4"" diameter pole. This pole is reinforced with a steel sleeve to give it a .250 wall - one of the strongest dance poles available! . 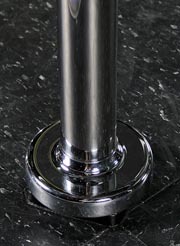 This pole is only available in 1 piece construction and polished stainless steel. The Portable PoleDanzer Spinning Dance Pole is custom built to the same high quality standards as our professional dance poles found in dance studios and fitness centers across the country. It is easy to install. You can put up or take down a Portable Dance Pole in just minutes. Great for any room in your home, apartment or RV. Take with you traveling, with quick and easy set-up, you will be spinning in no time. PoleDanzer has plenty of dance poles the choose from.